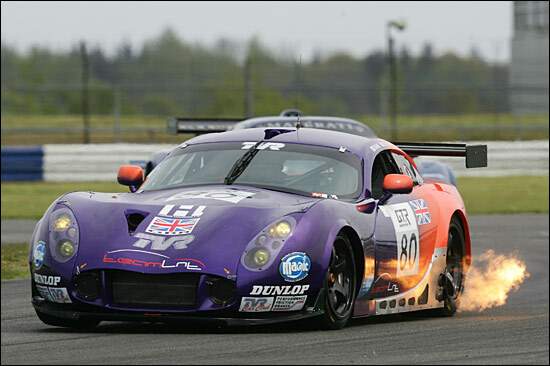 The 2005 season is emerging as a truly significant year for the TVR T400R and Team LNT, the results so far showing that LNT’s chosen path seems well founded. After strong runs in the opening British GT races, the FIA GT round at Magny-Cours and of course a historic 1-2 class finish in the opening round of the Le Mans Endurance Series at Spa, the May 14-15 weekend saw a further foray onto the international stage, with a single car entered in the Silverstone round of the FIA GT Championship. With strong opposition on parade from factory backed Porsches, Moslers and Ferraris, here was another good opportunity to measure the progress made so far, against the current yardsticks in GT2. The results of the work the team has been able to squeeze in to a hectic racing schedule (this race was the fifth so far this season), are already paying dividends. The single car entered for LNT (Jonny Kane and Lawrence Tomlinson) had certainly closed the gap to the Porsche factory-backed GruppeM Porsches since Magny-Cours, birthday boy Jonny Kane just a second astray of the class pole: the TVR had been almost four seconds adrift at Magny-Cours. “I surprised myself a little with that time,” said Jonny Kane. “We didn’t run with new rubber at all yesterday and got a 1:23.4. I thought that we could improve on that by a second but did a 1:21.8 in that (first qualifying) session and felt there was a bit more in hand. I’m particularly pleased that our improvement from yesterday has been more than the cars closest to us in times: the Embassy Porsche and the (GPC) Ferrari have moved forward too but not by as much. So then, a great platform to launch a racing effort for the three hour race on Sunday and, with a bright sunny day and a sizeable crowd to entertain, from the off Kane was straight into a head to head battle with British GT regulars Embassy Racing’s Porsche. The team’s tactic was to run its own race pace - three hours is a long time in a race car and it was entirely sensible to let the factory Porsches go. They pulled away, taking the lead Mosler with them, leaving a titanic three way battle between LNT, Embassy and a brand new Mosler from a third British GT team, Eclipse Motorsport. There was bad news early on though for LNT: a pit stop on the half hour for a suspected puncture would put the car down the field, a lap down to the lead runners and off its chosen strategy. Kane though was quickly back out on track after taking on fuel, lapping far quicker than the cars ahead of him and sitting tight, waiting for the other class runners to pit on schedule. With the hour mark approaching the leading GruppeM pair was maintaining a race pace in the 1:22s, with Balfe’s Mosler in the 1:23s and the Embassy / Eclipse battle in the 1:24s, a pace matched by the recovering TVR - while the remainder of the field were back in the 1:27s. Kane leapfrogged up the field as the regular pitstops panned out and was able to profit from an extra pitstop from Embassy Racing to grab third in GT2: the Balfe Mosler though was now out of reach ahead (but this car runs in a different class in FIA GTs). 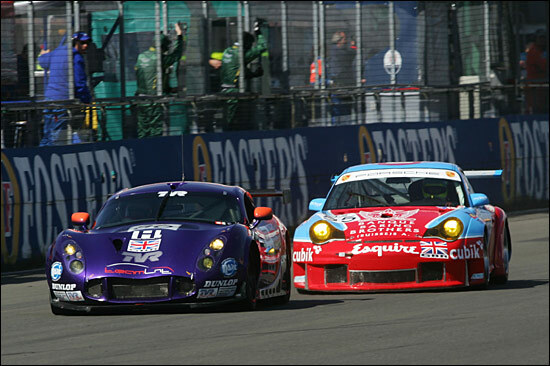 Kane though had to pit to hand over to Tomlinson, the Embassy Porsche unlapped itself and stormed away to try to close the gap for what looked like the final podium slot. Lawrence Tomlinson took over with just less than an hour to run, with the short international circuit at Silverstone being used the loss of the position to the Embassy car was never in doubt, and even a drive through penalty for the Porsche would not make up for the out of sequence stop. A podium finish looked like so near, but yet so far. But help was at hand as the second placed GruppeM Porsche growled down the pitlane, and the team’s body language clearly showing this was not a routine stop. 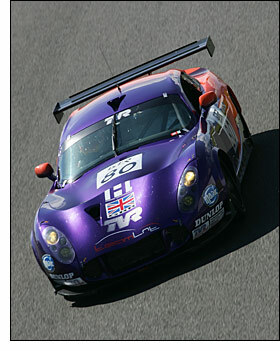 The TVR made the best of its opportunity and Lawrence Tomlinson was rock steady for the remainder of the race, as the Porsche lost lap after lap while the team effected repairs….. and it was TVR reliability profiting from a mechanical problem for Porsche. So it was a first, historic, FIA GT podium finish for TVR, with a champagne soaked Kane and Tomlinson delighted with their run. 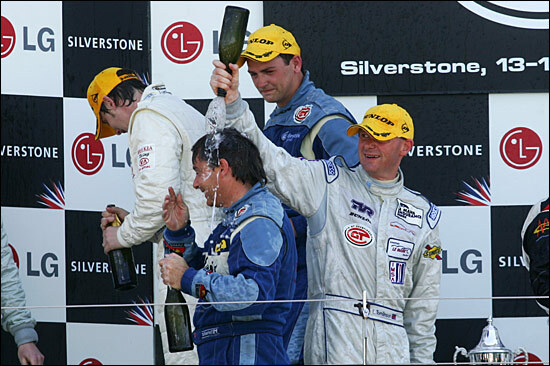 The team owner then suggested that the end of season flyaway races might well feature in the team's busy 2005 season - but until then, they'll concentrate on the British GT Championship and the LMES. 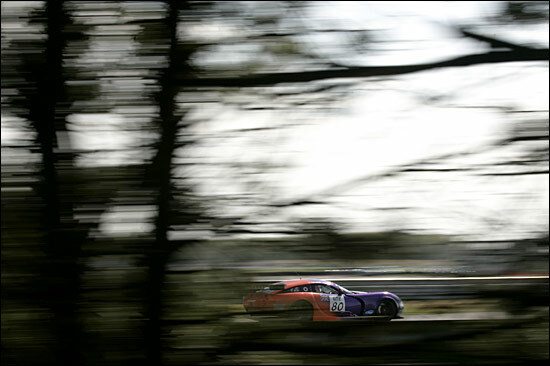 So Knockhill next for the British GT double header, races 6 & 7 in what is looking ever more like a breakthrough season for TVR, the T400R and Team LNT.